Stress fractures are quite painfully common in all walks of life, but athletes in particular run a much higher risk of suffering such an injury. The good news is that the majority of light stress fractures are not serious in nature and will heal naturally if rested and left to their own devices for a few weeks or months. Most sporting activities increase the risk of a person suffering a stress fracture, though as far as stress fractures in feet and legs go, running and jumping activities are the worst offenders. 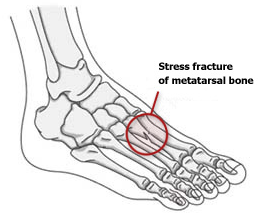 In fact, more than 50% of all diagnosed stress fractures affect the bones of the lower leg, while 25% occur in the instep bones of the feet – the metatarsals. Interestingly, women stand a much higher chance of suffering a stress fracture than their male counterparts – particularly women with irregular menstrual cycles. Youngsters are also among the most at-risk groups of all, for the simple reason that their bones may not yet have reached their full adult strength. Sadly, the bad news for those that have in their lives already suffered a stress fracture is that they have a nasty habit of coming back. In fact, up to 60% of individuals who suffer a stress fracture are known to have suffered one at some time in their past medical history. It can be difficult to identify a stress fracture without an examination, as the symptoms are very similar to those of several other minor injuries. The area in which the fracture is located may or may not be swollen, but will present a dull aching sensation that becomes much worse when standing, walking or putting any pressure on the affected area. The only sure fire way to diagnose a stress fracture is with a professional medical examination and an X-Ray. However, it’s not always possible for an X-Ray to spot the smallest of stress fractures, so it may be necessary to undergo an MRI. As for treatment, the general approach in most minor cases is to allow it plenty of rest to begin healing naturally. During the first day or two, ice can be applied to the affected area to help minimize pain and inflammation. Pain can also be reduced by taking standard OTC painkillers like ibuprofen and paracetamol, unless advised otherwise by a Phoenix sports medicine doctor. It may also be necessary to immobilize the area around the fracture using a walking boot or immobilization of the affected area. It may take 6 to 8 weeks for healing to occur. Additional treatment options include bone growth stimulators, stem cell injections, and as a last resort surgery. Generally speaking, it’s safe to once again begin putting weight and pressure on the affected area once the swelling has subsided. It may however be necessary to use crutches or a walking stick for as long as your healthcare provider deems necessary.